Microscope World is proud to offer the Ken-A-Vision Kena T-1050 digital microscope. With 20x, 40x and 100x magnification, this microscope offers both low and high magnification for a range of uses. The top LED light can be used to shine light down on specimens and the bottom LED light will help illuminate slides at higher magnifications. The Kena can be removed from the stand for handheld macro image capturing. Simply capture images by pressing the button on top of the camera. This feature makes field work easy. The Kena digital microscope runs on the power from the USB cable and 4 AA batteries operate the bottom LED light. The Kena microscope won the 2009 IDEA Design Award for International Design Excellence. The IDEA competition is a celebration of the most innovative and exciting product and product concept designs of the year and one of the world's most prestigious design competitions. 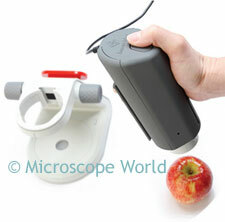 You can purchase the Kena Digital Microscope for home, school or field work from Microscope World.